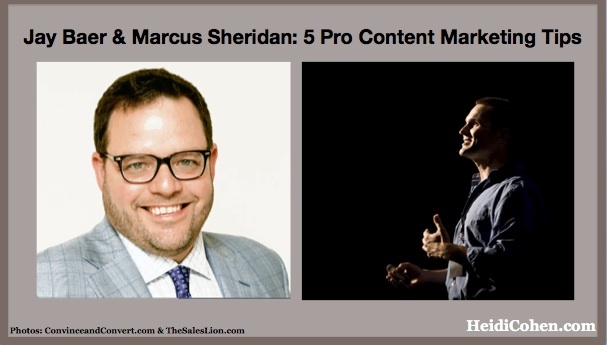 Jay Baer of Convince and Convert and Marcus Sheridan of The Sales Lion are 2 very astute content marketers. If you pay attention not only to what they say but also to what they do, you can improve your content marketing. I call these pro content marketing tips! At Content 14 in Copenhagen, Denmark, I had the pleasure of presenting with both Jay Baer and Marcus Sheridan. Watching and listening to these 2 content marketing rockstars, I learned a lot. Here are 5 pro content marketing tips to improve your content marketing results that I picked up from Jay Baer and Marcus Sheridan. It’s amazing to watch Marcus Sheridan in action. He steps off the platform and walks into the audience to interact with people one-to-one. While he was in college, Marcus spent 2 years in Chile as a teacher. This experience made him a natural educator. What sets Marcus apart from other speakers is that he doesn’t talk or teach. Rather he coaches his audience, leading them to make the conclusions he wants them to reach. Educate your prospects and customers. Don’t lecture them. No one wants to be talked at or told what to do. As a content marketer, you can teach your target audience using how-to’s and styling content, 2 of the 5 basic content types. Another way to accomplish this is to answer all of your customers’ questions. Marcus believes in tackling the tough questions including price. He generated $2 million in revenue by answering the price question for his pool company. This is central to both social media and content marketing. At the heart of the Cluetrain Manifesto is the notion that the Internet consists of human conversations. When you create content, the human element needs to be integrated into every aspect of your offering. Skip the corporate speak and speak in a human voice. Have real people write for real people. This extends to your content curation. Have a human editor select and comment on the information. Also include a person-to-person strategy to your content distribution as well. Show your face. There’s no better way to show your humanity than to use photographs and videos of your employees and customers. 3. Expand your content creation efforts across your organization. Among the top challenges content marketers face are lack of content (which translates to lack of resources or time) and lack of budget. One way to stretch your resources is to get other areas within your firm to support your content efforts. Marcus referred to this as breaking down the silos between marketing and sales. Face it—the people who know what your prospects and customers are asking are your sales and customer service teams. So it only makes sense to encourage them to help create content. Remove the barriers to content creation. “I can’t get the experts in my organization to participate in content creation” is something I hear all of the time. Instead, take a different approach: Make it ridiculously easy for people inside your organization to contribute to your content efforts. Get sales to blind copy (aka BCC) marketing every time they answer a customer question. Then transform this information into quality content. It’s much easier and cheaper to edit and optimize existing information than it is to create original content. Further, this saves sales time since they only have to answer each question once rather than again and again. Let people convey their information however it’s easy for them. Marcus Sheridan made this point. He cited a client who was a natural talker but hated writing. Marcus got him to answer questions in front of a camera. This content was edited into multiple videos. Show your information. Think photographs, videos, infographics and presentation. People process visual information 60,000 times faster. It’s the show don’t tell rule of content. Jay Baer gave the example of a Canadian car dealership that made a video every day showing an employee reading an inspirational quote. The employee didn’t need to use his words, just read. The short video was taken with a smartphone and placed on YouTube and their website. Quotes are highly shareable content. Additionally, they asked customers if they could videotape their answer to the question “Why did you buy your car from us?” Again it was easy for customers to create and many of their customers said yes. Even more important, they tended to reference the customer videos as a deciding purchase factor. 5. Get virtual business colleagues with whom you can talk business. 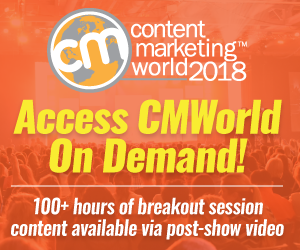 This is particularly important for content creators, especially those who may be the only content marketing employee in their firm or solopreneurs. I’ve written about this buddy concept related to blogging. You need peer input and support to produce great content. This connection can happen in real live, via phone or electronically. Get a buddy. 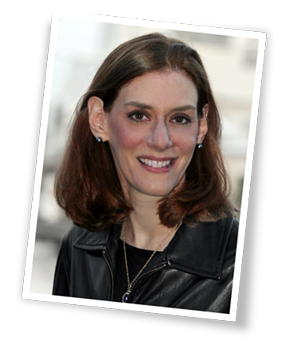 Find a peer with whom you can talk about the issues facing your content creation and business. This input provides an outside perspective. You can find likeminded people with whom to work at industry events or associations. This doesn’t mean that you can expect a well-known expert in your field to take you under their wing. If you need that type of support, understand that you’ll probably need to compensate someone for their time. The bottom line is the more you incorporate the human element into your content marketing, the better it will resonate with your target audience. How do you put the human in your content marketing? Tags Jay Baer, Marcus Sheridan. Bookmark the permalink. wedding in their life. It plays a major part in everyone’s life. Online marketing tips are good. One of the best posts on content that I have seen in a while.Bravo! Great Piece! you’re exactly right Kostas, Jay Baer among many other like Brian Fanzo and Ted Coine do a great job of making you feel like you’re sitting with them in a private setting have a conversation over a cup of coffee rather then listening to a keynote being delivered, this is why they’re content is so powerful. Thanks so much Heidi. I loved hanging with you in Denmark! Thanks for this Heidi, they are great tips. I particularly like “Be Human” I think many people forget that. But the easiest way to create engaging content is to treat your reader like a friend. Be approachable and conversational and you will see better results.